Tolkien metal band Battlelore from Finland have been paying tribute to the grandmaster of fantasy literature since 1999. On their sixth longplayer Doombound, the focus lies on Túrin Turambar, a character of the First Age of Middle-Earth. Battlelore took a little longer this time. The predecessor The Last Alliance, released already thirty months ago, didn’t receive as much critical acclaim as the band was used to, so that they worked harder on a more varied sound. Mostly they succeeded, but with the side-effect of making access to the music more difficult. The smart switching between raw, epic, folk and this time even doom parts works fine, but the overly harsh vocals by Tomi Mykkänen are contrasting too extremely with the music and the clearer vocals by Kaisa Jouhki. 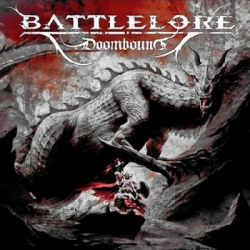 Battlelore are even acting rather quietly this time (the eight minute long title track even features a violin part), but Doombound is still a dynamic album without any idle moments. The album also contains a song in Finnish language, which makes all the more sense considering that Tolkien had been inspired by that very same one when he invented the Elvish language. Those of you in favour of a gaudy fantasy happening and unafraid of kitsch will certainly be delighted by Battlelore. Some people will consider Doombound a too straining affair, but those willing to invest the necessary patience will not cease discovering new details.